Added six new Pascal the Panda animated iMessage stickers, as drawn by David Lanham. Improved support for the new iPads. The watch app now downloads currency conversion rates independently from the phone. Added an option to use the digital crown to roll the RPN stack in the watch app. You can now create and edit the position of the parentheses count in layout editing mode. Fixed a problem importing layouts or settings stored on an iCloud Drive. Fixed a problem with the version number displayed in the Settings app. Added support for the new iPad Pros and iOS 12.1. You can now long press or swipe up to use the number key shortcuts in the watch app. You can now swipe left and right on the display to undo and redo in the watch app. Fixed a problem renaming the decimal separator button in the iOS app. Added an option to use a dark theme in the watch app. Added new sets of functions to the third page of the watch app, including powers and trigonometry. Added more swipe down shortcuts to the watch app. Fixed a problem adjusting large numbers with the digital crown in the watch app. Fixed a problem with the deg/rad/grad buttons on the "Advanced" splitscreen layout. Added an option for currencies to show four decimal places. Added an option to turn off the digital crown in the watch app. Added a new line display type which always shows the x register as a fraction. Fixed a problem with the ticker tape being scrolled too much to the right on iOS 12. Fixed a problem with the iOS app being stuck in scientific mode. Fixed a problem setting the display background color for the "Dark Night" theme. Fixed a problem with the watch app losing settings. Various improvements to the watchOS app. You can now swipe down on the number buttons in the watch app for quicker access to the operators. Added an option to display the x register value on the watch corner complications. Added an option to display the watch complication icons in black and white. You can now rotate the icon and tap to throw bananas in the watch About screen. Added "Pascal Mode" to the watch complications. Improved support for iOS 12 and watchOS 5. Added full support for Apple Watch Series 4. Added the ability to create custom buttons that open a URL. They can run Siri Shortcuts, or talk to any app that supports the x-callback-url protocol. Added initial support for x-callback-url interapplication communication. Use [x-register], [y-register], or [m-register] in URLs and that text will be replaced by the appropriate value when the URL is opened. If you set the x-success parameter for any x-callback-url to "pcalc://x-callback-url/set" (suitably encoded) it will set the display with the result. Set the x-error parameter for any x-callback-url to "pcalc://x-callback-url/error" and it will flash "Error" on the display if there is a problem. Added new Siri Shortcuts functions for rounding to a certain number of decimal places. Fixed a problem with VoiceOver and the Deg/Rad/Grad button. Fixed a problem on iPads that caused PCalc to occasionally show "Don't Panic!" on the display. We apologize for the inconvenience. Added full support for iOS 12, including Siri Shortcuts. Added full support for watchOS 5 and Apple Watch 4. Improvements to copy and paste, and drag and drop. Tape is now wider on iPad Pro devices. Added a button to reset all layouts to the main section of the settings. Made "Dark Night" the default dark theme, and now use it on the widget. Fixed a problem with Engineering display mode sometimes being used instead of Scientific. Fixed a problem with the "Sync App and Widget" setting not sticking on iOS 9. Fixed a problem with the acknowledgements section and certain themes. Fixed a problem with the "Erase All Settings and iCloud Data" button not resetting layouts. Modernized a lot of underlying code. Added a set of animated iMessage stickers featuring Pascal the PCalc panda, as drawn by David Lanham. PCalc now requires iOS 9 or later. Fixed a problem with operator precedence and powers. Added a new theme, "Dark Night". Added support for measuring angles with grads in trigonometry functions. Added an option to display SI prefixes in Engineering display mode. Added a "Percentage Total" (%T) button to the layout editor. Added a button to erase all settings and iCloud data. Renamed "Use Constant Functions" to the more obvious "Repeat Operation on Equals"
Fixed a problem searching for units in the conversion section. Fixed a problem pasting values with a unicode minus sign. Added an option to show x10 in scientific notation, in the Advanced settings. Added options to turn off the labels and info on the display. The display is now smarter about using the available space. You can now change the tint color for the themes "A Touch of Color", "Blue Sun", "Brawn", "Flux", "Primary Colors", "Rough Draft", and "Widget". You can now use hyperbolic trigonometry in user functions and conversions. The About screen now has an ambient electronic soundtrack composed by Squillopian. Improved the iPhone X support yet again. Added Icelandic Króna to the currency conversions. Fixed a problem loading the currency rates. Fixed a problem with the "Decimal X Register" line type. Fixed a problem importing and syncing custom layouts. Fixed a problem with the 3D Touch tape display not being scrolled to the end. Improved the iPhone X support a little bit more. Improved the iPhone X support. Added achievements and leaderboards to the About screen. Added an option to set the maximum denominator for the fraction display mode. Fixed a problem with the binary line display. Fixed a problem with button labels drawing too small. Fixed a problem with the chosen splitscreen layout being forgotten. Added mini About screen to the Apple Watch app. † Level 2 requires iOS 11 and a device with an A9 processor or later. Look for the golden banana! Support for the iPhone X. Completely rewrote the display code. Many exciting things to come later which are now possible because of this, but some changes today! You can now adjust the size of the digits in the display, and make them much bigger or smaller. You can now use a space for the thousands separator. Hex, octal, and binary numbers are now grouped using spaces on the display. You can now have lines displayed in two columns on a horizontal iPhone or iPad. You can now edit and reorder the list of favorite currencies. Added a arbitrary base "Log N" button to most of the advanced layouts, and you can edit other layouts to add one. Added a variety of new digit styles. Added an option to use haptic feedback for buttons in the "Key Click" section of the settings. Added an edit cursor option to the Accessibility section. Fixed a crash if you pressed on a conversion, function, or constant category name while editing. Fixed a display problem with the tape and the "Show implied parentheses" option. Fixed a problem with the normal layout being reset if you opened the app in splitscreen. Added a few more alternate icons, for old times' sake. † The fancy 3D/AR About screen needs a recent device that supports Metal, ideally an iPad Pro or an iPhone 7/7+ or later. The 3D stuff requires iOS 10, AR support requires iOS 11. Added links for downloading the manual to the Help section. Did we mention there's now a manual?! Yes, after nearly twenty-five years, there finally is. Written by one Glenn Fleishman, it's a general introduction to the app, as well as an extensive list of all the settings and buttons and what they actually do. Added an option to stop themes being applied to menus, in the Advanced section of the settings. Fixed a crash when importing settings from an iPhone onto an iPad, or vice versa. Added two new alternative icons, "Helms" and "Protocol Gold". Added a gray theme tint. Fixed a display problem on the 10.5-inch iPad Pro. Fixed a problem with "Gravity Mode" leaving buttons at an angle when switched off. Added a "Resend Tips to Other Devices" button to the tip jar. That should help if your tip didn't show up on them for some reason. Added four new alternative icons, "Deep Purple", "Unicorn", "Baker", and "T-1000". Added a "Deep Purple" theme tint. Added a weird "Gravity Mode" option in the Advanced section of the settings. Fixed a problem (in PCalc Lite only) with the alternative icon being reset if the app is quit. Sorry! Added an option to change the app icon on iOS 10.3 or later (if the icon doesn't change on the home screen, restart your device and that will fix it - iOS bug, sorry!). Along with the ability to change the icon between the existing blue and orange versions, there are nineteen more icons to choose from including lots of colors and some old designs going way back to 1992. To unlock those icons, we've added an optional tip jar. Since we've never charged for an update, this is an experiment to see if people feel like dropping some extra coins into the jar as a way of supporting the release of new versions. Even if you don't tip, you'll always have the full functionality available. Added a new "Hot Pink" tint color for the "Samurai", "Samurai Night", and "Backlight" themes. Now blink the display if you press Equals and the answer is the same as the previous number shown. Now the change sign button doesn't finish entering a hex, octal, or binary number, so you can keep editing it. Now supports pasting of Arabic-Indic numerals. The "TC" button now correctly deactivates 2nd functions. Fixed a crash when tapping "Reset to Defaults" in settings. Fixed a crash if you toggled the RPN setting after tapping "Done" in the Advanced section of the settings. Added the ability to export all settings and user data from PCalc into a single file, send that to another device or to somebody else, and import everything again into a different copy. Works between PCalc and PCalc Lite too. Added an option to the "Advanced" settings to show labels on the buttons for 2nd functions. Added support for display of UTF-32 characters in the registers / stack section. Fixed a problem displaying fixed scientific notation with zero decimal places. Fixed a problem adding the multiply button when editing layouts in non-decimal modes. Instead of offering an "Upgrade Pack" in-app purchase, PCalc Lite now lets you buy the full version of the app directly. All other in-app purchases are unchanged, and the "Upgrade Pack" still works exactly as before if already purchased, giving identical functionality to the full app. But hopefully this should reduce confusion with people expecting the icon and name to change. Fixed a problem with prices being cut off for some currencies in the PCalc Store. Rounding is now back to the "Nearest or Even" rule by default, by popular demand. Added a new "Rounding" section to the Advanced settings, which controls the display, as well as the behaviour of the "Round" button. Added an option to the Apple Watch app to stop it automatically switching back to the number pad. Fixed a problem with the "Fraction" display mode on 32-bit devices. Improved support for iOS 10 and watchOS 3. Added support for haptic feedback on the iPhone 7 and 7 Plus. Added an option to display improper fractions in "Fraction" display mode. Round function now always rounds half upwards to the nearest integer. Fixed a problem with the widget not loading on an iPhone 7 Plus. Fixed a problem pasting in fractions of the form "2 3/4". Added support for iOS 10 and watchOS 3, including a brand new widget and an updated watch app. New look widget on iOS 10, including a mini calculator when you 3D Touch the PCalc icon. Added a new "Fraction" display mode that shows the closest fraction for the current decimal result. Added an option to lock the calculator orientation in either portrait or landscape - iPhone only for now. Added an option to use key clicks in the widget. Improved the key clicks, and added some new options for them. Stereophonic sound! Now display all shortcuts when you hold down the Command key on a physical keyboard. Now handle the keyboard being shown in another app when in splitscreen on an iPad. The widget now respects the "Bold Key Text" accessibility option. LCD digit, background, and theme colors are now remembered separately for each theme. Now use monospace digits throughout the app for better readability. Now show "HEX", "OCT", or "BIN" in the display to better indicate the current base. You can now change the display mode from the menu that appears when you double-tap the display. You can now set the brightness threshold when the automatic night mode activates. You can now choose the style of buttons when editing a layout. Made it harder to accidentally trigger the layout editing mode. The color pickers now display the name of the selected color. Fixed a display problem with parentheses in the tape. Fixed a performance problem with the ticker tape. Fixed a crash when resetting an edited layout. Fixed a crash when going into the "Accessibility" section on iOS 8. Added support for game controllers. Yes, really. Added a dedicated dictation button, and Scribble support on watchOS 3. You can swipe left and right to switch section on watchOS 3. You can use the digital crown to adjust the current number on watchOS 3. Added an option to use E notation for the main display rather than superscript numbers. Added a unit conversion section to the Apple Watch app. Added a watch complication to quickly access the Apple Watch app. Added a quick "Reset All Buttons..." command to the layout editing alert if there are any changes. Added a warning the very first time you try to switch on RPN mode. Changed the number entry and delete key behaviour to be more sensible for decimals and exponents. You can now have eight lines of display on a horizontal iPad Pro. You can now specify certain settings like RPN mode and number of decimal places separately for the app, watch, and widget. The display mode setting is now used by the watch and widget. Moved the watch and widget settings into separate new sections. Fixed a problem with the theme resetting to "Samurai" if you used the automatic night theme option. Fixed a problem with the minus sign not always displaying properly with the LCD digit style. Fixed a problem with hiding the status bar when running in split-screen. Fixed a problem emailing the tape or registers when you 3D Touch the display to peek at them. Fixed a problem with the "Use Animations" accessibility setting not applying to the splashscreen. Fixed a problem with VoiceOver for the tape, registers, and RPN stack. Fixed a problem with existing numbers not being pushed to the RPN stack when starting a new one with the decimal or "Exp" keys. Fixed a problem with Handoff from the Apple Watch. Added support for 3D Touch on the iPhone 6s and iPhone 6s Plus. Added 3D Touch icon shortcuts for quick access to PCalc functionality. Added a new "3D Touch" section to the settings to configure the shortcuts. Press the display to peek at the tape, registers, or RPN stack. Fixed a problem with the “Programming” layouts. Fixed a problem with pasting into PCalc on iOS 7. Watch app now gives haptic feedback for button taps. Added a new "Accessibility" section to the settings with options to make PCalc easier to use. Added an option to increase the size of the text on the tape. Added an option to turn off the watch haptic feedback in the Advanced section of the settings. Text in the settings and other sections now respects the system text size. The "Use Phone Layouts" option in the Advanced section of the settings now applies to split-screen multitasking as well. Fixed a problem where "Error" could get stuck on the screen forcing you to quit the app. Fixed a problem with multiplying or dividing by percentages. Fixed a problem with Handoff not using your RPN setting. The "Programmer Pack" was accidentally left switched on by default in PCalc Lite 3.5 but this has now been fixed - hope you enjoyed the free taste! Added support for iOS 9 and watchOS 2. Added support for split-screen multitasking on iPad. Added native Apple Watch app. The watch app now requires watchOS 2. Added support for Handoff from the Apple Watch app to your other devices. Added an option to switch off dictation on the Apple Watch in the Advanced section of the settings. Added options to control the speech rate and volume when speaking actions and results. Added new functions to the layout editor. Added a delta percentage button to most layouts as the 2nd function of percentage. Changed behaviour of the percentage key in algebraic mode to match the Apple calculator - old behaviour still available via "Display Percentage Result" option in Advanced settings. The tip calculator in the Apple Watch app now uses the digital crown for setting the inputs and shows the split, tip, and total all at once. Now display "Error" rather than just blinking the display on an incorrect operation. Added support for dictating numbers and simple calculations into the Apple Watch app - just tap the display. Added an ellipsis to the tip calculator on the Apple Watch app, to better hint that tapping the result will cycle through different values. You can now paste simple calculations into PCalc. Fixed a problem with the button layout of the Apple Watch app when bold text was switched on in the watch settings. Fixed a problem with copying from the tape in a custom layout. Added support for the Apple Watch - now you can use PCalc without taking your phone out of your pocket! Includes a full calculator app, a tip calculator, and a glance to see the result of your most recent calculations. Added a warning message to avoid accidental layout editing. Fixed a problem with the widget on a landscape iPhone 6 Plus. Widget now displays the full iPad layout on a landscape iPhone 6 Plus. Added toolbar buttons to quickly switch 2nd and RPN modes while editing layouts. Stopped accidental triggering of buttons in the widget when scrolling in Notification Center. Fixed a problem with the "Sync App and Widget" and the "Simple iPad Widget" settings being forgotten. Fixed a problem editing the "2nd" property of buttons in the layout editor. Fixed a problem with the "Use Constant Functions" setting. Fixed a problem with the "Shake Behaviour" setting. Fixed a problem setting the Y register in user functions. Various fixes for iOS 8. Added full support for iOS 8. Added support for the iPhone 6 and iPhone 6 Plus. Added support for layout editing - just tap and hold on any button to begin. You can even add dedicated buttons that perform conversions, run functions, or enter constants, too! Added a Notification Center Widget on iOS 8 to perform quick calculations. Tap the display to switch to the full app. Added support for Handoff on iOS 8 to continue the current calculation on another device. Added an option to switch off operator precedence entirely. Added an option to only show the RPN stack in the "Stack" section and keep it scrolled to the bottom. The display now shrinks down to a single line when you are in other sections to maximise visibility. All text fields are now drawn to match the current theme. Improved hardware keyboard support and added new keyboard shortcuts. Fixed a problem with operator precedence. Fixed a problem with PCalc not responding to touches the first time it was opened. Updated the core calculator code to match PCalc 4 on OS X. Smart searching for conversions, constants, and functions - try “£ to $” in the search field, for example. User functions and conversions can now access the RPN stack, use bitwise operators, and get and set values on the clipboard. Now show a double zero key instead of an "Exp" key when in accounting mode. You can now choose to automatically display big or small numbers in engineering mode, rather than scientific. You can now add notes to the tape. You can now specify which themes are used for the automatic night mode. Added an option to switch to night mode based on the current screen brightness. Added a new dark theme "Backlight". Added a "Last" key in algebraic mode which retrieves the result from the last time you pressed equals. Added an option to display the ticker tape at the top of the display. Added trend arrows to the currency rates. Added support for hex, octal, and binary user functions and constants. Added "Rol n" and "Ror n" buttons for rotating by an arbitrary number of bits. Fixed a problem entering negative fractions. Fixed a problem pasting in some hex, octal, and binary values. Fixed a problem drawing the register labels on the display. Fixed a problem with the screen being offset after sending emails when PCalc was horizontal. PCalc no longer uses your location in the background for the automatic night theme option. Fixed a problem displaying percentage operations on the tape in RPN mode. Added 64-bit support for the iPhone 5S. Added a new darker iOS 7 theme, "Samurai Night". Added an option to automatically switch to "Samurai Night" when it's dark outside. Added an accounting mode that automatically enters a decimal point and rounds the display to two decimal places. Added an option to make the text on the keys bold. Added new commands to the user functions and conversions. Now display dark menus on an iPhone when using a dark theme. Now disable the deg / rad buttons when not in decimal mode. Now support touch typing using VoiceOver. Fixed a problem adjusting sliders using VoiceOver. Fixed a problem displaying the tape and registers in certain themes. Fixed a problem hiding the status bar. Fixed a problem with double-height status bars. Fixed the sorting in the "Density" section of the conversions. Added full support for iOS 7, including a new minimalist look for PCalc. Added a new default iOS 7 theme, "Samurai". The other themes are still available in the settings. Smarter display on iPhone, uses bigger font size when there's fewer lines of data to display. The tape now shows all operations including functions, conversions, and constants. Added support for speaking actions and results on iOS 7. Added new digit display options. Added "Gas Mark" to the "Cooking" section of the unit conversions. Added an option for constant functions in algebraic mode - press equals to repeat the last calculation, or enter a new value and then press equals. Added an option to greatly increase the size of the text on all buttons. Added an option to use dynamic type on iOS 7. Added an option to hide the status bar. Added an option to switch off all animations. Added an option to the PCalc URL scheme to set the current layout - useful with apps like Launch Center Pro for launching PCalc in different setups. Usage is pcalc://layout/<layout name>. Added a button to change all settings back to their default values. PCalc now inserts an implied equals if you start entering a new number mid-calculation. On the phone, tapping the display at the bottom while in settings, conversions etc. will quickly return you to the main calculator. Fixed a problem with user constants not syncing correctly via iCloud. Fixed a crash when editing functions and conversions. You can now create your own conversions and functions with a powerful built-in editor. User conversions and functions can be shared with other people, and are synced across multiple devices automatically using iCloud. Updated built-in scientific constants to 2010 values from CODATA. Added an option to show the live result of the last function used on a line of the display. Fixed a problem drawing the ticker tape with custom display colours. Fixed a problem editing user constants in landscape mode. Fixed a problem with thousands separators not appearing when you copy or email the tape. Fixed a problem with the engineering display mode. Fixed a problem with external hardware keyboards input not working. Fixed a problem starting up on an upside down iPad. Added an option for a "Ticker Tape" which shows a history of recent caculations underneath the main display. Added a "Basic" horizontal layout on the iPhone / iPod touch. Added an "Advanced" option on the iPad to let you use the keyboard layouts from the iPhone / iPod touch. Added an "Advanced" option to increase the size of the text on the number keys. Added an "Advanced" option to disable the quick fraction entry by double-tapping the dot key. Added "Minutes Per Mile" and more to the "Speed" section of the unit conversions. Added "Foot-lamberts", "Candela Per Square Meter", and more to the "Lighting" section of the unit conversions. Added "dBm" to the "Power" section of the unit conversions. Added "Kilocalories" and "Calories (Nutritional)" to the "Energy" section of the unit conversions. Added "Angstroms" and "Microns" to the "Length" section of the unit conversions. Added "Centiliters" to the "Volume" section of the unit conversions. Changed "Bytes" unit conversions to have both decimal and binary prefixes (1000 vs 1024). Keys now support multi-touch typing for better accuracy and responsiveness. iPad multitasking gestures now work correctly. Fixed a problem dividing negative non-decimal numbers. Fixed a problem with some of the Advanced options not being visible. Fixed a problem edting constants using international number formats. Fixed a problem with the "Last X" button. Added support for the iPhone 5 and new iPod touch. Added support for iOS 6. Improved the "Rough Draft" theme. Fixed a number of problems with the user constants editing. PCalc now requires iOS 4.3 or later - unfortunately Apple's developer tools for iOS 6 don't support older systems. You can now add and edit your own constants. You can now export user constants via email, and import them on other devices. User constants are synced across multiple devices automatically using iCloud. Added a density section to the conversions. Added all the functions from the Mac version - click the ƒ(x) button to access them. Includes "Complex Numbers" and "Financial" categories. On the iPhone and iPod touch, the AC function is now accessed by double-tapping the C button - needed to make space for the ƒ(x) button. You can now show up to eight lines of display. MC now lets you pick a specific memory if multiple memories are enabled. Made the currency conversion section more self-explanatory. The screen error flash is more visible again. Improved support for the Retina display on the new iPad. Added an indicator to the LCD (where there's space) to show Normal / Scientfic / Engineering mode. Tap it to switch mode. Significant performance improvements when entering numbers, particularly on iPad. The glow effect is back when using the Flynn theme on the new iPad. Fixed a problem with the pcalc://settings and pcalc://ac URLs. Added support for the Retina display on the new iPad. pcalc://set/12345 - set the main register to 12345.
pcalc://convert/12345 - set the main register to 12345 and open the conversions section. pcalc://constants - open the constants section. pcalc://tape - open the tape section. pcalc://registers or pcalc://stack - open the registers section or stack in RPN mode. pcalc://settings - open the settings section. With multiple memories switched on, the registers section now displays the grand total and you can M+ / M- / M in / M re all the memories at once. Added a new calculator theme, "Brawn". Added an option to set the upper value where scientific notation display starts. You can now use the minus button to change the sign of an exponent as you are entering it. Now strip underscores when pasting values into PCalc. Fixed a problem with thousands separators not showing on the tape, registers, and conversions. Fixed a problem with operator buttons not working. Fixed a problem with parentheses level indicator not updating when you hit equals. Fixed a problem with the Monolith font on iPad. Fixed a number of drawing problems on older devices such as iPhone 3G and iPod touch 2G. Fixed the horizontal line that appeared when using a split keyboard on iPad on iOS 5. Various other fixes for iOS 5. Added support for external hardware keyboards - there is a list of key shortcuts in the help section. Added a "Frac" button to most layouts for quick fraction entry. You can also press the decimal point button a second time. Added swap buttons in the conversion section to quickly set the base unit. Added a new "Lighting" section to the unit conversions with lumen, lux, footcandles etc. Added inch/mm of mercury and water to the pressure conversions. Added proper units to all of the constants. Added an option to disable Auto-Lock while PCalc is open. Added a new digit style, "Typewriter". The "Monolith" digit style is now available on the iPad too. Improved readability in the conversions and constants sections. Improved startup speed with very long tapes. Fixed a problem with the "shake to undo" gesture. Fixed a problem with the registers not opening on iPad. Fixed a problem with blank menus on iPad. Fixed a problem with the option to disable vibration on error. Fixed a problem with the "Copy On Close" option in the Advanced settings. Fixed a crash on rotation. Fixed a problem with the "Exp" button not working on some systems. Fixed a problem with the "2nd" button becoming highlighted after a rotation. Fixed a problem with the "Clear On Open" and "Paste On Open" options in the Advanced settings. Added an option for a fixed four register RPN stack with X, Y, Z, and T registers. Fixed a problem copying or emailing a tape containing hex, octal, or binary calculations. Fixed a problem sending emails on iPhone / iPod touch. Fixed a problem with zeros appearing in the RPN stack after unit conversions. Fixed a problem with the thousands separator and multiple memory options not appearing after in-app purchase. You can now display the tape, registers, and RPN stack on screen all the time on an iPad in landscape. The tape and registers now reflect the appearance of the current theme. Improved the emailing of tape and registers. Added an option to show an editing cursor when entering numbers. Added new force and temperature unit conversions, with thanks to Georg Schober. Now always perform an integer divide in Hex, Octal, and Binary modes. When the RPN stack is full with 128 entries, pushing a new number will drop the oldest one. Fixed a rotation problem when opening PCalc upside down on an iPad. Fixed a problem with background music stopping for PCalc key clicks. Fixed a crash that could occur with the constants and conversions. Improved support for the Retina display on the iPhone 4. Opening the conversions now finishes entry of the current number. Added a special low-light calculator theme, "Flynn". Added dozens of new unit conversions. You can now sort the units in the conversions section by name or by magnitude. Added a volume control for the key click sounds. Added an option to stop the "AC" button from clearing the memories. Added an option to show or hide the key popups. Added labels to the display on iPad in portrait mode. Moved the thousands separator option into the main settings section. Improved detection of overflow in Hex, Octal, and Binary modes. Improved speed of application switching on iOS 4.0. Added support for iOS 4.0 and fast app switching. Added support for the Retina display on the iPhone 4. Fixed a crash that could occur with the constants and conversions on iOS 4.0. Added support for the iPad. Fixed a problem with the currency conversions in some regions. Reload the rates if you still see problems. Added a brand new currency section to the unit conversions. Added "<< n" and ">> n" buttons to the programming layouts for shifting by an arbitrary number of bits. Fixed a problem with settings being reset occasionally. Fixed a problem with custom LCD colours not being saved. Changed the "Del" button to look like the standard iPhone backspace. Made the recent conversion swap buttons much easier to press. Added support for the standard "shake to undo" gesture. Added an option to stop the "AC" button from clearing the tape. Added an option to stop iPhones from vibrating on errors. 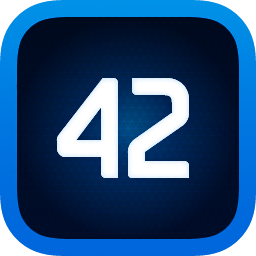 You can now purchase all the extra features from the full version of PCalc from inside PCalc Lite. Buy them individually, or buy everything. Added a new calculator theme, "Flux". You can now customize the decimal and thousands separators in the advanced settings. You can now show thousands separators in the register, stack, and unit conversion sections. Added options to automatically copy and paste when PCalc is closed and reopened. When using multiple memories, the memory keys now highlight to show which memories have values stored in them. Gamma function now works on a wider range of inputs. Improved performance and handling of low-memory situations. PCalc now requires iPhone OS 3.0 or later. You can now swipe up and down on the LCD screen to change the number of lines displayed. You can now separately set the number of lines displayed for the horizontal and vertical modes. Added a mod operator as a 2nd function of the divide button. Added an option to set the lower value where scientific notation display starts. Added three and four line display modes with full control over what's displayed on each line. Added an option to increase the number of available memories to ten. Added an option to stop the calculator rotating horizontally. Added an option to make the RPN behaviour match more modern calculators like the HP48. Added a "Last" button to the RPN layouts which pushes the previous value of X onto the stack. Added "SC", "CC", and "MC" buttons to separately clear the stack, calculation, and memories respectively. Added commands to copy the tape and RPN stack to the clipboard on iPhone OS 3.0. Added separate UK / US tablespoon and teaspoon units to the cooking conversions. Added a new full-featured vertical layout, "Engineering", that includes all the functions from the horizontal equivalent - no need to rotate anymore. Added a new layout, "Programming", in both horizontal and vertical flavors, geared towards hex, octal, and binary calculations. Fixed a display problem with the tape in hex mode. Added a new horizontal layout, "Engineering", that includes hyperbolic trig functions, hypotenuse, leg, gamma, delta percent, and more. Added a new calculator theme, "Widget", taken from PCalc for OS X. Added a choice of six different key click sounds. Added an option to show the most recently used conversions and constants for faster access. Added many more unit conversions including a new cooking section. Added four new digit styles to choose from. Added a new calculator theme "Twilight" taken from PCalc Lite. Added small theme previews to the settings. Added "Newtons" to the weight conversions. The two-line display option is now much more responsive and shows the contents of the memory when not in RPN mode. Fixed a display problem with the parentheses buttons. Fixed a display problem with the "High Power" theme. Added an option to show a two-line display for use in RPN mode. Added two new calculator themes. Now use a comma or a dot as the thousands separator, when it's set to be a character we can't display. Changed the behaviour of percentage and delta percentage to match PCalc on OS X. Fixed a problem with very large and small numbers not causing an overflow. Fixed a problem with first thousands separator sometimes not being displayed. Fixed a problem displaying the correct number of decimal places for some numbers. Added support for switchable button layouts - choose from many different horizontal and vertical layouts. Added support for calculator themes - comes with three new optional appearances with color-coded buttons. Added an option to show trailing zeros up to a fixed number of decimal places. Added an option to make the "2nd" button switch off automatically after the next button press. New horizontal mode layout with improved button placement and the number buttons on the right-hand side. Double height equals/enter button in all the default layouts. RPN mode is now a separate switch in the settings. You can now email the whole stack when in RPN mode. Made value text larger in constants and conversions section. Made the dot and comma larger in the "Easier To Read Digits" option. Changed "Exp" button to automatically insert a 1 before the exponent if no numbers entered. Percentage key now works more like HP calculators in RPN mode. Cube root now supports negative numbers. Factorial is now calculated using the gamma function. Added multiple undo and redo. Flick the LCD to the right on to undo, flick to the left to redo. You can now change the colors of the LCD display and digits. Made the operator buttons more readable. Reversed the order of the operator buttons to match other calculators. More improvements to the RPN mode. Fixed a problem displaying large hex numbers on the tape. You can now email the contents of the tape and the display. Changed the RPN Drop behaviour to match HP calculators. Rearranged layout slightly to show "Del" button in RPN mode. Added some fuel efficiency conversions. Added display of ASCII / UTF-8 / UTF-16 values. Added a Help section to the Settings. Now correctly disable the "8" button in octal mode. Fixed the RPN "Roll" button in horizontal mode. Fixed a couple of memory leaks. iPod, iPhone, iPad, iOS, Mac and the Mac logo are trademarks of Apple Inc., registered in the US and other countries.